There are a few spaces left in the following summer camps during the week of July 11-15. Dates & Time: July 11-15 (Monday through Friday) 3:15 - 4:15 p.m. This class focuses on teaching students how pulse correlates to drumming on various percussion instruments. It is an interactive-based class focusing on the basics of rhythm, pulse, and musical creativity. Students will learn how to play a variety of percussion instruments such as hand drums, shakers, tambourines, and blocks and use them to create their own call-and-response songs. No previous music experience required! Dates & Time: July 11-15 (Monday through Friday) 12:30 - 3:00 p.m. 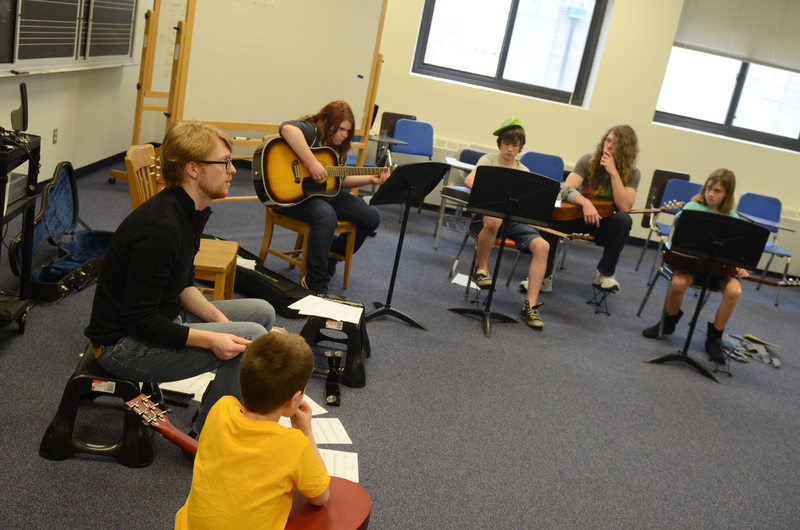 The Terre Haute Guitar Club is for beginning to intermediate levels, offering an opportunity for students to learn to play the guitar and create music while working with a group of peers. Students work on guitar techniques and musical concepts through engaging games and activities. Guitars are supplied to students in-class. No previous music experience required! This summer, our Guitar Club classes for ages 5-8 and 9-12 are free of charge and will be held at the Vigo County Public Library. Enrollment will be accepted on a first-come, first-served basis. Call Crystal Myers at 812-237-2528 to enroll. There are a few spaces left in the percussion and rhythm camp and The Terre Haute guitar club during the week of July 11-15.